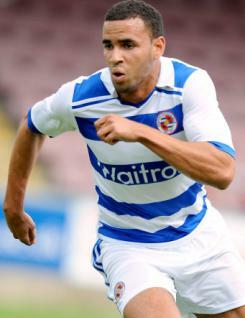 Hal Robson-Kanu is a young winger who plays for Reading. A strong player who is effective when taking on opponents with the ball and who can also play in a forward role, he has gained experience during loan spells with Southend and Swindon Town. Yet another promising academy graduate, he is now a full international for Wales despite having previously represented England at U19 level. His clever turns and acceleration with the ball are his greatest assets, along with one of the most powerful strikes at the club. Hal suffered two cruciate ligament injuries when a scholar, but is now a powerful member of the first-team squad and showed the best form of his career to date towards the end of 2010-11.